...your choices become limited and you can feel stuck-- chained to your problems. 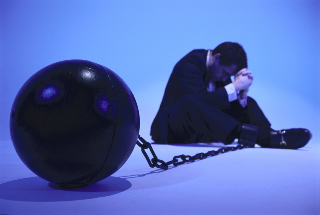 This is the pattern of a life consumed with anxiety, depression, addictions, anger, difficulty concentrating or psycho-physiological trauma: Instead of taking control by deciding-- then pursuing-- what you do want, your perceptions of the world and ways of responding to it are based on what you do not want, leaving you chained to your problems-- a victim! Not knowing what they truly want, people often search outside themselves for ways to break the chain, but instead continue to make poor decisions-- often out of awareness-- which keep them stressed and seeking help. "If only I could have or do the things over which I lack control, I could break free of my problems." Knowing what you want is the key... And rather than changing your life, you need to recognize-then express-- stillness inside. Profound awareness will emerge when you are present to each unfolding moment as life shows up. Like this, you can decide what you truly want. In the process, you will have learned to become...changeless.